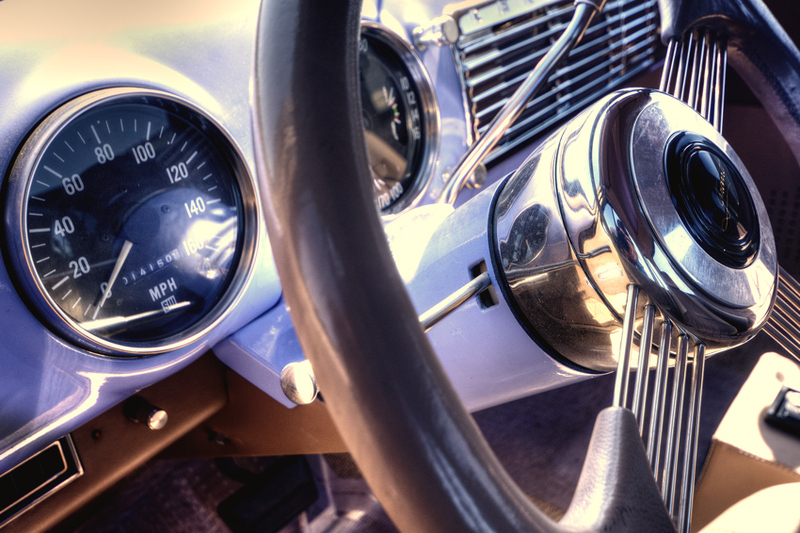 We are learning that Vintage Car Shows are a treasure for photographers. The exacting details the proud owners take to showcase their babies is inspiring. With this beauty it seemed like almost all parts were chrome plated including the Holley Header. Holley Performance Products is an automotive performance company based out of Bowling Green Kentucky. Holley, when based in Michigan, was one of the major producers of carburetors, being supplied as standard equipment on many Detroit-built automobiles. 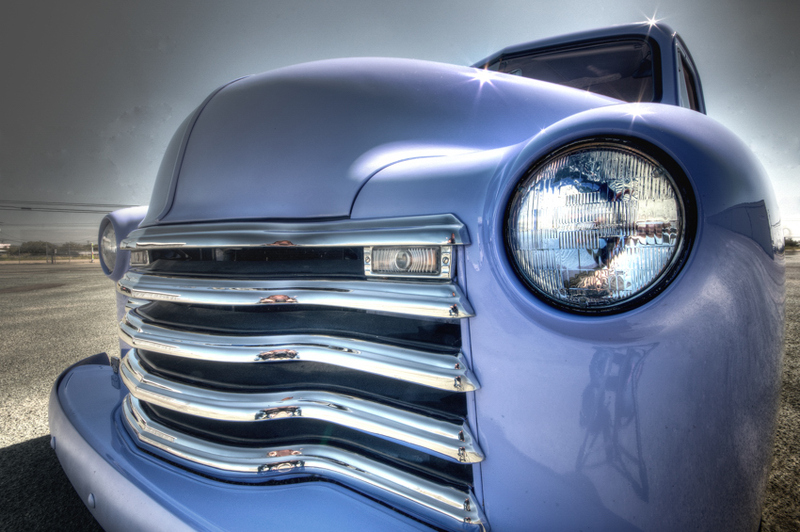 This is a shot from a Vintage Car show in Lido California. 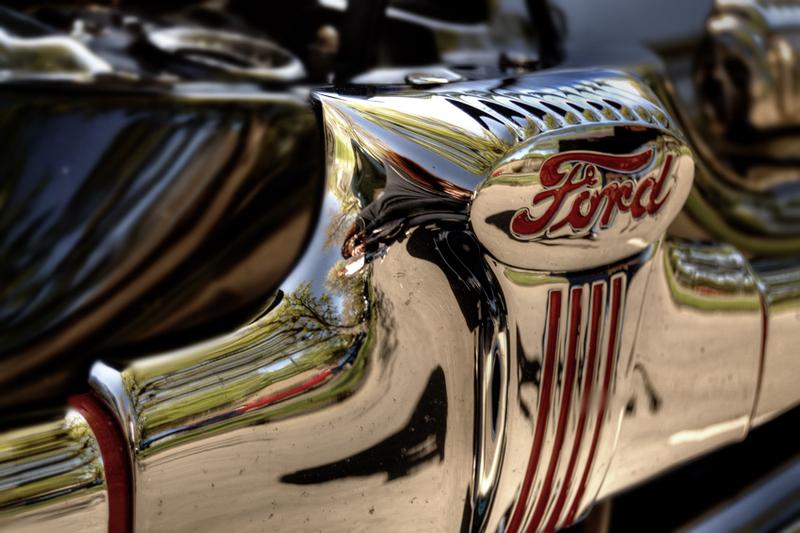 This glistening bumper caught our eye on this dazzling Ford. 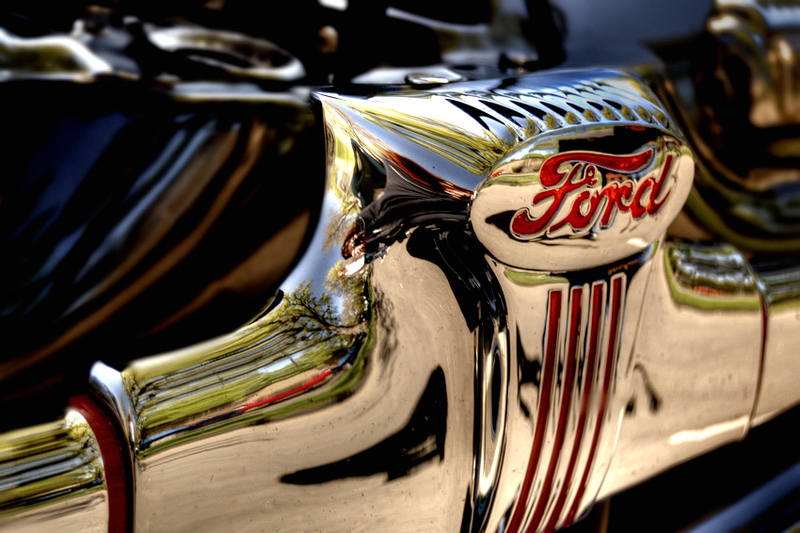 Ford Motor Company is an American automaker based in Dearborn, Michigan, a suburb of Detroit. The automaker was founded by Henry Ford and incorporated on June 16, 1903. His introduction of the Model T Automobile revolutionized transportation and American industry. As owner of the Ford Motor Company, he became one of the richest and best-known people in the world. Ford introduced methods for large-scale manufacturing of cars and large-scale management of an industrial workforce using elaborately engineered manufacturing sequences typified by moving assembly lines. Henry Ford’s methods came to be known around the world as Frodism by 1914. We had the pleasure of shooting an amazing restoration this weekend just outside of Sacramento at the Lodi Airport. 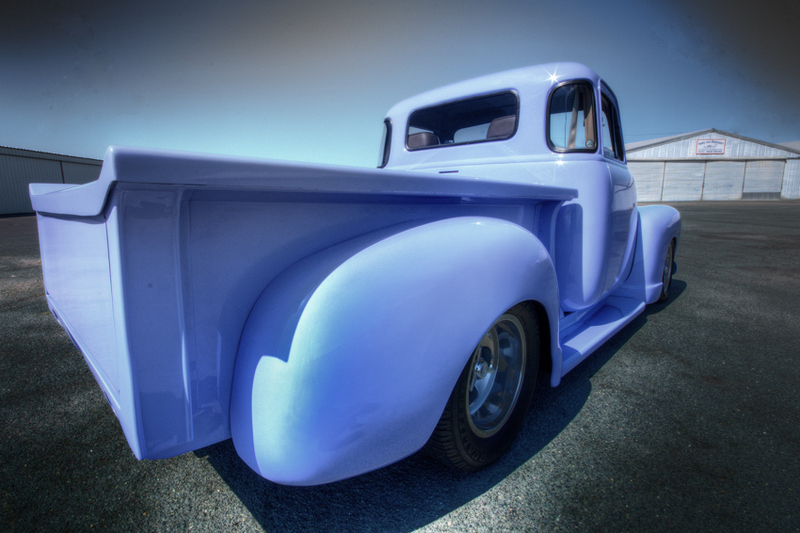 Tish and Rich were kind enough to drive this beauty out for the shoot…Here is their story! 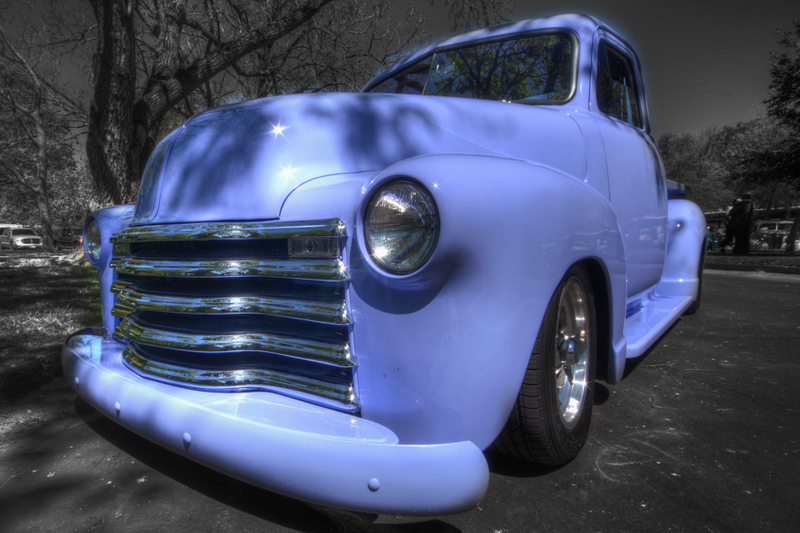 The truck is a 1950 Chevy 1/2 Ton 5-window pickup and it was a Mother’s Day present from my husband. When Rich found it at a swap meet in Turlock , it was a “project” and had to be transported in pieces on a flatbed tow truck to our home in Pleasanton . After 18 months the mechanical rebuild was completed but the exterior was still unfinished. When we drove it to its first car show it was painted black but had dijon mustard colored primer spots on various body parts where the customizations were still in progress. The truck was called ‘ Holstein ‘ all weekend as a result. 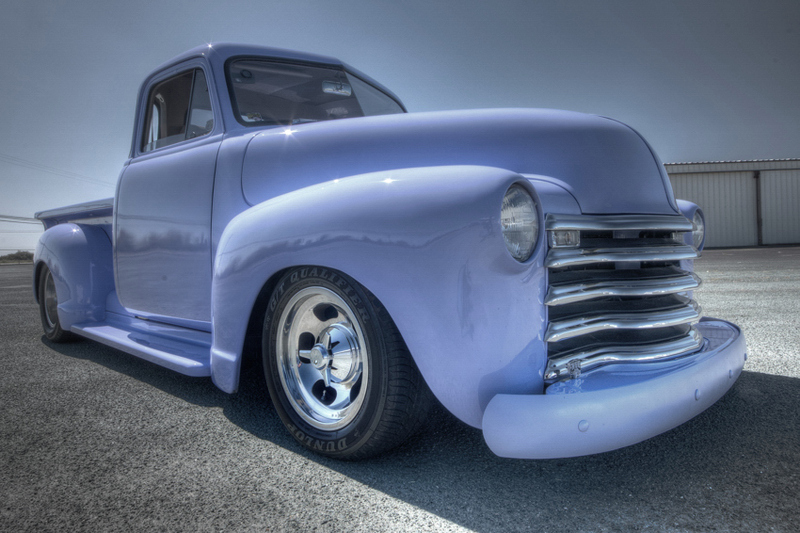 After all the body mods were done, it finally received its namesake color of periwinkle. This was my favorite color when I was a little girl so I took the Crayola periwinkle crayon to the paint shop and had the color matched to that crayon. I’ve never regretted choosing that color because it always catches peoples’ eyes and generates a lot of interest. She is now known as the Periwinkle Princess and I’m proud to say she has over 13,000 miles on her and has not been trailered anywhere since she was completed. Rich started the P-Town PushRods in 1994. He had been looking for car owners that shared our love of cruising around in street rods but didn’t want the rules and cliques found in the car clubs he’d checked out. He drove around Pleasanton looking for street rods in driveways and open garages. He would periodically drive by those houses again until he saw the owners working on their cars. He would then stop and talk to them to see if they were interested in getting together for breakfast once in awhile and going on car cruises. We started out with 8 couples and eventually had over 185 people on the roster from places as far away as New Zealand . 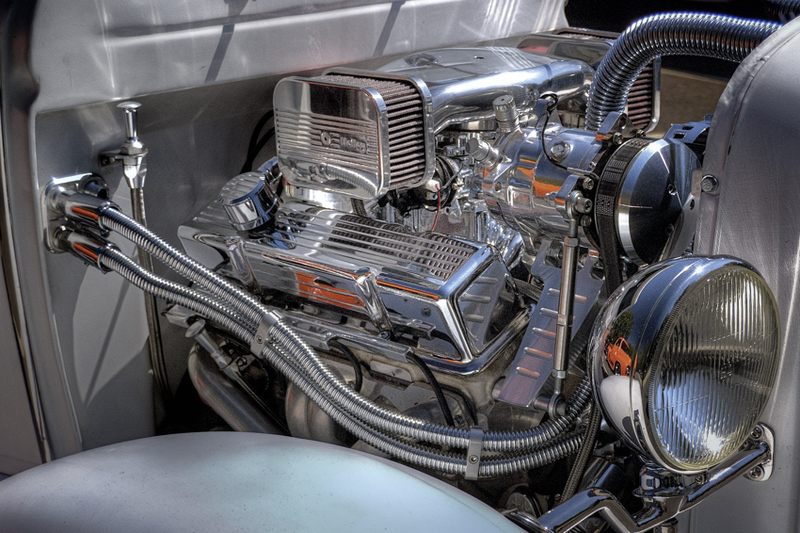 The name P-Town PushRods came from Pleasanton ‘s nickname and the double meaning of pushrod as an engine part what we have to do when there’s a breakdown; push ‘rod’. If you look closely at the club’s logo you will even see 2 hand prints on the trunk of the car. We consider ourselves an ‘un-club’ since we don’t have any rules or official officers. All the men are Vice President because they don’t want to have to do anything and all the women, aka: Rodettes, are President because someone has to be in charge to get stuff organized. 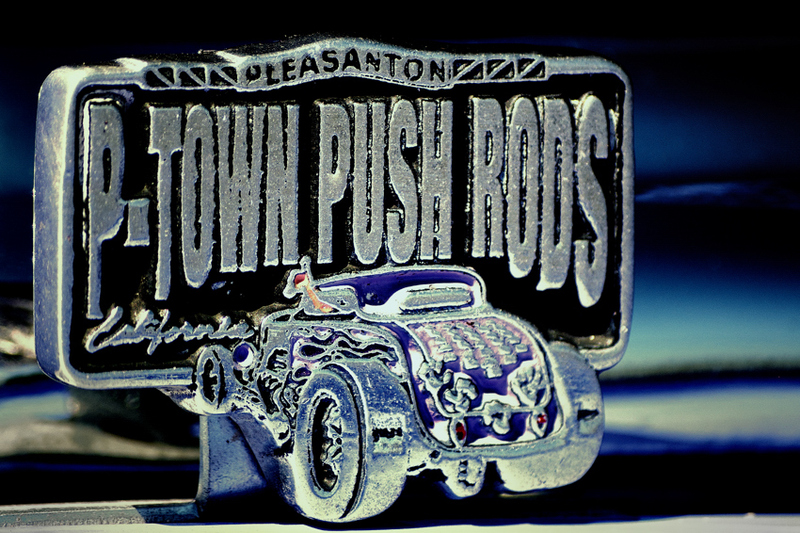 The PushRods are the ‘host association’ for the 4 Good Guys car shows held at the Alameda Fairgrounds in Pleasanton . We volunteer to help out at the entry gates and specialty area parking. In return, our volunteers get free passes into the show and a reserved area for us to park in. At these shows we sell t-shirts with our cars on them as a fundraiser for different causes. Over the years we have donated tens of thousands of dollars to various organizations including the National Cancer Society, the Alisa Ann Ruch Burn Center and Hope Hospice. We also adopt families during the holidays and visit patients at the Veterans Hospital in Livermore . During the West Coast Nationals show in August, the PushRods bring veterans from the hospital to the fairgrounds for a bar-b-que lunch in appreciation of their service to our Country. Since Rich and I moved to Stockton , we aren’t as active in the club as we used to be but once a PushRod, always a PushRod. We still love to meet up with our car buddies and hit the road with our street rods whenever we can.